CEI02N7 N Channel Product N-Channel Enhancement Mode Field Effect Transistor By Chino-Excel Technology Co., Ltd. This is one package pinout of CEI02N7,If you need more pinouts please download CEI02N7's pdf datasheet. 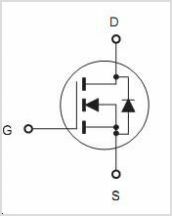 This is one application circuit of CEI02N7,If you need more circuits,please download CEI02N7's pdf datasheet.